Blog Should You Trust All Google Tip Sheets? Should You Trust All Google Tip Sheets? I recommend looking through these posts to learn about all the operators Google offers. And here is a warning: many other online tip sheets and example searches have outdated or wrong info. Here’s an article, worth reading, from Karen Blakeman: GUARDIAN’S TOP SEARCH TIPS FOR GOOGLE NOT QUITE TIPTOP, It discusses this post from the Guardian.com and its not quite tip-top content. I can name others who have posted tips that, unfortunately, don’t match the reality. Here is an example – How to find candidates by keyword (skills and experience) – from Workable – which has multiple mistakes. For example, it lists AND as an operator (it’s not); states that the Asterisk * makes Google search for variations of a word (it doesn’t); says that parentheses () group words, while they don’t make any difference in Google. Other tip sheets from Workable have mistakes as well. I could name a dozen more other sites with incorrect information (ask me if you are curious). Some typical mistakes in the questionable posts include the plus +, which is no longer an operator; using AND and the parentheses; using the asterisk as part of a word; listing the operator NEAR (it doesn’t work on Google); listing the operator link: that no longer works; and suggesting to search for email addresses by using the symbol @. 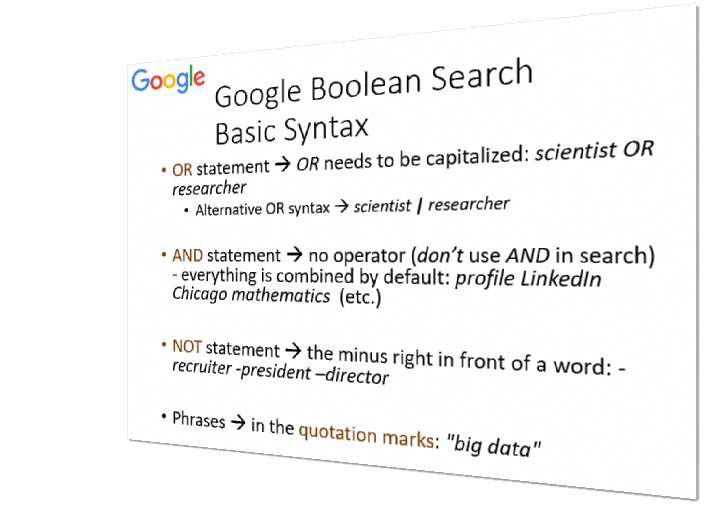 Conclusion: don’t blindly trust various “Google Boolean” posts – read them with a grain of salt. Compare what those posts say with the correct sources that I listed at the beginning of this post, to see what’s right and what is a mistake. It wouldn’t hurt to try example searches if you are unclear how particular search syntax works. On May 2nd, I will present a Lecture “Advanced Google Sourcing Workshop” with in-depth coverage of Google’s operators and their applications in Sourcing. As always, the webinar comes with one month of support. Can’t wait? You can get the latest presentation recording at the same link. I used Hiretual, and their boolean query builder for google doesn’t seem to follow any of your suggestions above and it is the most popular query builder. For example, here is a query I created with their boolean builder – it has AND’s and Parenthesis and it got me 153,000 results. So, maybe you are wrong and Google still supports these operators? Thanks for your comment. “Boolean Builders” are often wrong in the syntax they present us. I am afraid Hiretual is no exception. Hiretual here implies that the parentheses work, while they are ignored. You can simply verify that if you omit all the parentheses in the above string, the results would be the same. Then, the multiple “OR”s deprive us of some matching results, see my post https://booleanstrings.com/2014/12/19/stop-using-boolean-or-on-google/. “popular” doesn’t mean “correct”, does it? The problem – if you can call it a “problem” – is that at times Google is so good at re-writing a search (such as the one shown above) and returning reasonable results that one thinks Google has indeed run your Boolean search as specified. I know what you are saying!